Born in 1955. A male singer from Fukuoka Prefecture. Made his debut as a singer with the 1972 single “Otokonoko Onnanoko”, which catapulted his status to top idol. Aside from his career as a musician, he has appeared in TV dramas, and alongside the other two big three idols of the time, Goro Noguchi and Hideki Saijo, saw success in music programs and talk shows. After the ‘80s, released such big hit tracks as “Aishu no Casablanca” and “Nioku Yonsenman no Hitomi” in an attempt to step aside from his status as an idol. 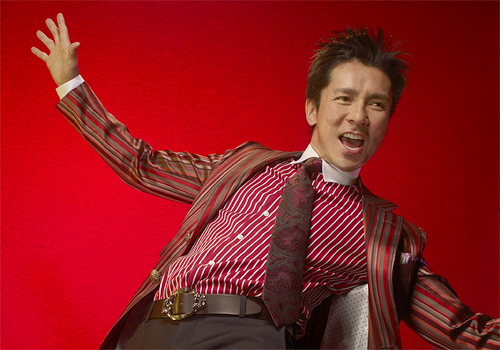 During the 90’s and on, had huge success with ballads such as “Ienaiyo” and “Aitakute Shikatanai”, along with dance tunes such as “GOLDFINGER ‘99” and “Nakatta Koto ni Shite”. From 2002, he took a break from his musical career and lived in New York for three and a half years. In April 2005, with the release of the single “Ai Yori Tsuyoku”, he officially restarted his musical career, and since then, has strongly continued on.